Dolphins have the longest memories in the animal kingdom, longer even than the famously unforgetful elephant, say scientists: the sea-dwelling mammals remember friends' whistles after being separated for more than 20 years. Researchers from the University of Chicago took a bunch of captive dolphins and tried to determine whether or not each creature recognised their fin-waving buddies' signature whistles after more than 20 years of living apart. 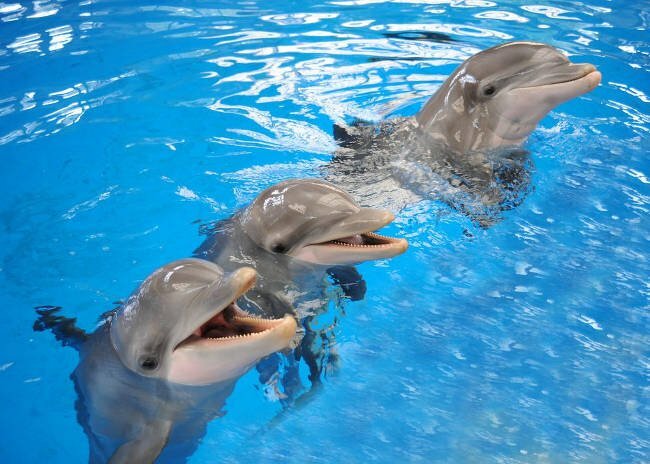 The signature whistles are thought to be the dolphin equivalent of names, and the eggheads said the Flippers clocked recordings of their dolphin pals' signatures despite being separated for decades. "This shows us an animal operating cognitively at a level that’s very consistent with human social memory," said cognitive ethologist Jason Bruck, who conducted the study. Bruck used a captive group of 53 bottlenose dolphins at six facilities that were all part of a breeding consortium, so the dolphins had met at some point as records going back decades confirmed. Scientists already know that dolphins each have a signature whistle, can recognise others' whistles and respond to hearing their own. To test how long they would remember each other for, Bruck played recordings of signature whistles of unfamiliar dolphins along with those who used to live together to see if there was any difference in response. The mammals would generally get bored pretty quickly listening to the whistles of dolphins they didn't know, but they would perk up and respond when it came to an old mate of theirs. In one example, a female dolphin called Allie recognised the whistle of Bailey, a female she had last chatted to 20 and a half years ago. Dolphins in the wild do break away from one group and join another, which could have led to the development of their long memories, but there's no certainty about the evolutionary purpose of their ability to keep recognising each other.